Participants take part in a dragon boat race to celebrate Dragon Boat festival in Tongren, Guizhou province, China May 30, 2017. REUTERS/Stringer ATTENTION EDITORS - THIS IMAGE WAS PROVIDED BY A THIRD PARTY. EDITORIAL USE ONLY. CHINA OUT. Participants take part in a dragon boat race to celebrate Dragon Boat festival at a wetland park in Hangzhou, Zhejiang province, China May 30, 2017. REUTERS/Stringer ATTENTION EDITORS - THIS IMAGE WAS PROVIDED BY A THIRD PARTY. EDITORIAL USE ONLY. CHINA OUT. 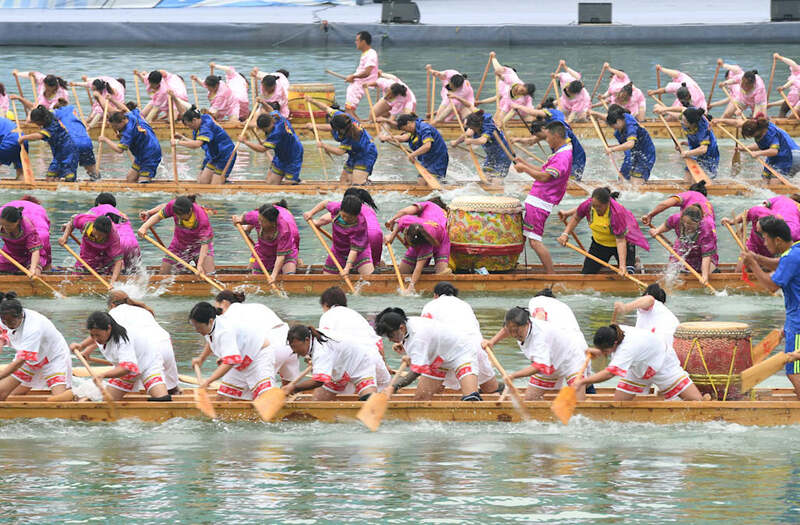 TAIPEI, May 30 (Reuters) - There was cheering, drumming and a disciplined display of coordinated strength at the annual dragon boat races on Tuesday in the Taiwan capital. Athletes paddled vigorously through the water in unison to the beat of drums, covering a distance of 500 meters (1,640 ft) on the Keelung River before reaching the finish line. Spectators chanted and cheered on the racers and spoke of the vibrant atmosphere and team spirit at the yearly affair. "In this sport, we need ten people to do the exact same movement," said dragon boat racer Hsu Tzu-han, whose team won in their 10-man category. "To achieve (this) coordinated strength, every person has to concentrate on every paddle stroke every day," he said. "This is the biggest challenge that we faced." Dragon boat racing is now a sport, but the festival has its roots in Chinese folklore and is held annually on the fifth day of the fifth month of the lunar calendar to commemorate the death of legendary hero Qu Yuan, who drowned in the Mi Lo River over 2000 years ago while protesting against corrupt rulers in China. The story goes that people attempted to rescue Qu Yuan by beating drums to scare fish away and by throwing dumplings into the water to prevent the fish from eating his body. Apart from the dragon boat races, people also make rice dumplings and wear scented sachets to ward off bad luck.